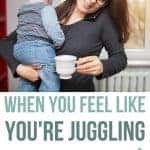 Juggling too many things at once is bound to break you at some point unless you figure out how to manage your time as a busy mom. Before you get to that point where you drop all the balls at once, it’s so important to take a step back and ask yourself these three questions. We deal with a barrage of questions like this daily. Somehow, we’re supposed to know where every single thing is in the house…even if you’ve never touched it. You’re also supposed to know what is coming up for every single meal…even if dinner hasn’t even crossed your mind. Somehow you’re supposed to know how to manage your time as a busy mom. Being a mom, wife and just a woman requires some innate order to her brain to keep all of this stuff straight. Or so it seems. The constant feeling of having way too many balls in the air is draining, isn’t it? Juggling too many things at once is bound to break you at some point unless you figure out how to manage your time as a busy mom. Before you get to that point where you drop all the balls at once (and look around trying to figure out how the heck that happened so quickly), it’s so important to take a step back and assess. IS EVERYTHING YOU ARE JUGGLING IMPORTANT? Sometimes we take on tasks just for the sake of doing, without making sure it’s something that is important to you. One of the keys as you figure out how to manage your time is to eliminate things that aren’t important. Is there anything that you are doing right now that isn’t important? Or it could be something you are doing at home that wouldn’t really matter if you stopped. Making sure everything that is taking that valuable brainpower of yours is meaningful. IS EVERYTHING YOU ARE JUGGLING WORKING? Not everything works 100% of the time. Maybe it’s a task at work that you are in the habit of completing every week, but it’s not yielding any results. You keep doing the same thing over and over and it’s just not working. There’s gotta be a better way. If something isn’t working, rather than continuing to waste your time, take a step back and come at it front another angle. Pivot and try something new. HOW ARE YOU ARE PRIORITIZING YOUR TIME? When you are feeling overwhelmed, take a good look at how you are prioritizing your time. Sometimes it is easy to get lost in the middle of the busy schedule and the long to-do list. The most important things in your life should be taking the most time in your schedule. As you try to figure out how to manage your time, it can be helpful to write out what you are doing during the days everyday for a week. As you move through your day write in how much time you are taking on each task (ie: 7am-8am Getting Ready, 8am-8:45am Driving to Work, etc.) At the end of the week, you will probably be shocked when you see this all written out. If there is anything that you are completing wasting your time on (ahem…checking out social media), it should be fairly obvious. Stephen Covey said: “The key is not to prioritize what’s on your schedule, but to schedule your priorities.” Your priorities should be reflected in your schedule, so if you find that they aren’t – it’s time to rethink how you are spending your time. Is everything I’m juggling important to me? Is everything I’m juggling working right now? Do my priorities match how I’m spending my time? 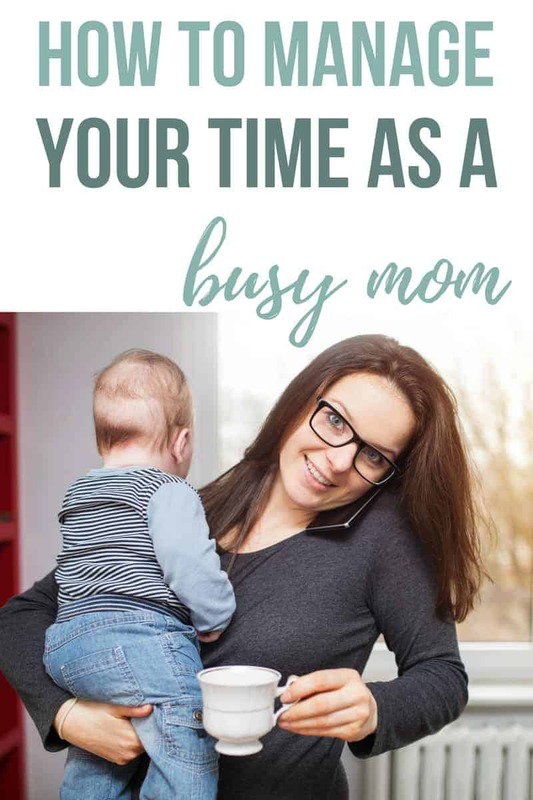 What other tips do you have for others that are struggling with how to manage your time as a busy mom? Related – Need some more encouragement mom?